Published: September 2004. Last Updated: May 2012. 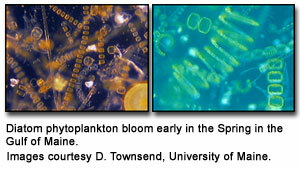 Phytoplankton are microscopic plants that form the base of the marine food chain. Though they are small, the energy they capture from the sun through photosynthesis helps to sustain almost all life in the ocean. They're also important to life on landphytoplankton produce more than half of Earth's oxygen supply. In this chapter, you will learn about the variables that influence the abundance of phytoplankton. By using this knowledge, you will make predictions about the timing of the spring phytoplankton bloom in the Gulf of Maine. Data from buoy monitoring stations can then be graphed and interpreted to assist in making predictions. Examination of the chlorophyll concentration data at each buoy provides further ability to check your predictions. You will then also compare your predictions with reality by obtaining and examining Moderate Resolution Imaging Spectroradiometer (MODIS) images to view the full extent of the bloom over time.